Automotive accounts are lust worthy in the ad world. Big budgets, big markets, and in America, what someone drives usually speaks volumes. For a first swipe at the automotive category, CP+B got handed the runt of the litter. A small car. with a micro-sized budget. With they eyes of the world on them, failure would have been understandable. Look at non-luxury foreign car brands in the US- Renault, Fiat, Citroen, had all thrown in the towel. Others, struggled to sell cars. Sterling anyone? Out of home, but top of mind. Who wouldn’t want to ride? They set the bar pretty high- turn car advertising as we know it upside down. By studying car culture, analyzing iconic brands, and uncovering the unique characteristics of our brand and best prospects, we created – “Motoring” – an alternative culture of driving. And, by using non-traditional media and traditional media in non-traditional ways, we proved we’re different and stood out. MINI sold out its first year, and we have achieved measures on key metrics that are better than brands that have been around for years and outspend us 10 to 1. It turned out, the keys were all based in research, and well tuned creative. Print ads that don’t look like car ads. Ad Age awarded the campaign of the year for 2002- and CP+B agency of the year. The decade of CP+B had arrived. 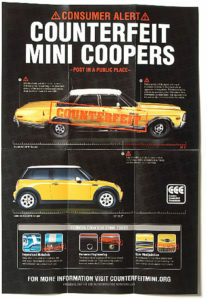 How to identify counterfeit Mini Coopers? That’s a problem? 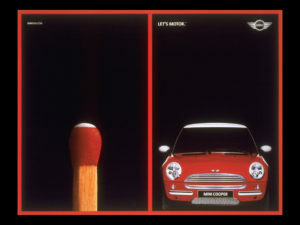 Just about the only reason we could find for not giving BMW’s Mini launch Creativity’s Campaign of the Year award was that we have also made its creator, Crispin Porter + Bogusky, our Agency of the Year. Which, of course, is no reason whatsoever. And so Mini beat the charms of Nike’s uniquely bizarre Presto work from Wieden & Kennedy; Leo Burnett’s beguiling Altoids campaign, which has cleared the product off the shelves; and the Apple “Switch” campaign, from TBWAChiatDay. In truth though, it really wasn’t much of a contest this year. 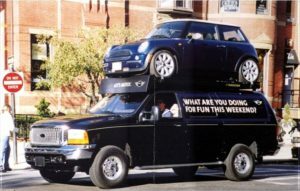 When do you see a car, riding on another car? For fun? The amount of creative generated in a single year was obscene. It helped build the reputation of CP+B as a sweatshop, but, it also showed that small budgets can be made to work harder than the hardest working men in the ad business. And while we’ve showcased some of work, the one ad that won me over into a CP+B fanboy was in Columbus Ohio on the side of a tall building. 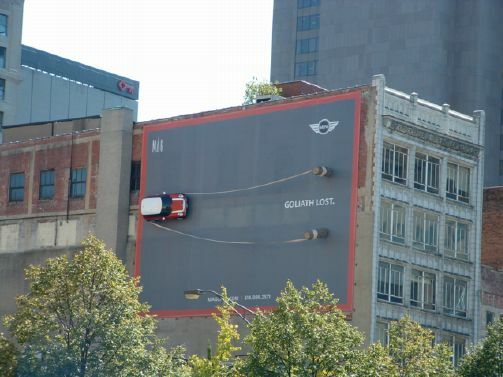 It had a Mini Cooper on the wall- mounted as the rock in a giant slingshot, with a two word headline; “Goliath Lost”. MINI sold 25,000 cars in the U.S. last year – 5,000 more than projected, and MINI has surpassed its sales projections every month since the launch. MINI spent roughly $567,000 for each percentage point of awareness. 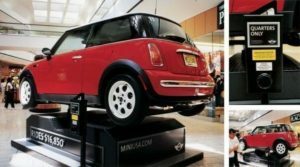 The other 12 brands in MINI’s competitive set spent an average of $5,973,000 (or more than 10 times as much) to do the same. Landed them VW- a much bigger account.